In as much as I want to jump straight to the travelogue, I wanna focus on individual teasers of the places interests first the way I saw it and in the perspective that my nikon camera had. I am a native of Pangasinan which is part of Region 1 or Ilocos region but I have never been more north of San Fernando La Union until last week so this is another first. Surprisingly, Ilocos Norte lived past my expectations. It is a destination you should not miss. 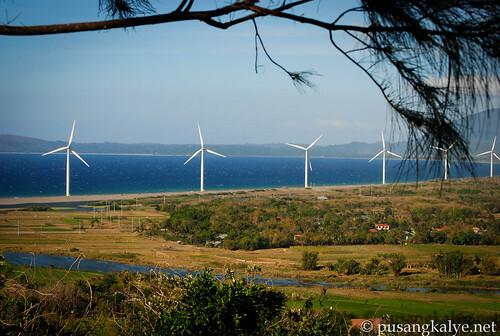 The Bangui Windmills got its name from the Municipality where they are located, Bangui Ilocos Norte which is approximately 1.5 hours away from thye provincial capital Laoag City in the south and 30 minutes from Pagudpud. 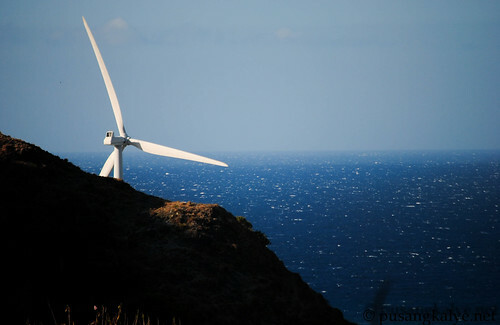 The windmills are officially called the NorthWind Bangui Bay Project. 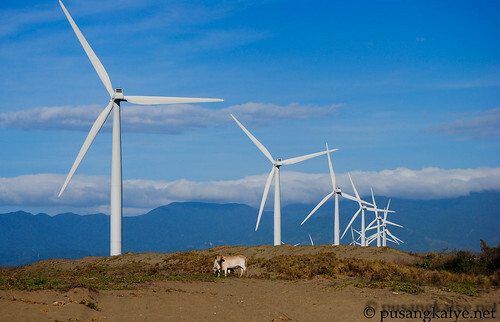 It is the first Wind Farm in the Philippines consisting of wind turbines on-shore and is considered the biggest in Southeast Asia. 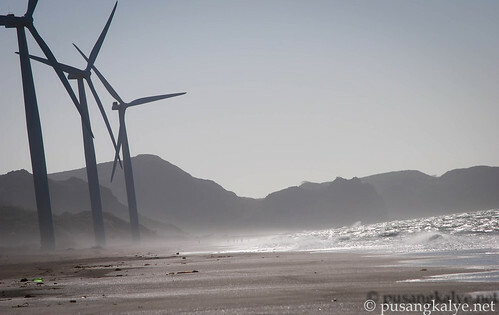 The project sells electricity to the Ilocos Norte Electric Cooperative (INEC) and provides 40% of the power requirements of Ilocos Norte via Transco Laoag. 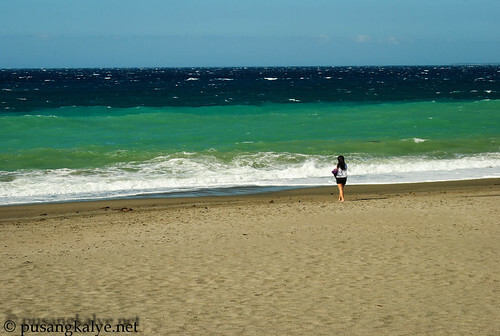 big waves characterize this part of bangui Ilocos Norte---see the color of the sea? The beach front here is sandy but not white and powdery. Because of the strong wind, one would not even think of swimming here. I even had difficulty taking pictures because the lens of my camera catches the spatter of the sea water. That being said, I cannot expose my camera long enough and cant go close to the shoreline as well so I didn't achieve the angle I wanted. The sand also goes with the wind so it could be annoying if you stay long. Then again, the experience in itself is amazing. This part of Bangui is not inhabited, at least in the beach area. The houses are a few kilometers away uphill. I could imagine how powerful the winds could be if there is a storm or something. On the southern part are mountains which are also uninhabited so the location is perfect if I may say so. So there, to spill the beans, the feeling I had before that this windmill farm is an eyesore in as much as it is friendly to the environment was completely shattered during our visit. All that's left now is my admiration to the initiative of Ferdinand Marcos Jr. to push for such facility in Ilocos Norte. There is actually a story behind that. The reason why this project was passionately pursued was because of the poor quality of electricity Ilocos Norte recieves from the LUZON GRID. It's understandable because the grid ends in La Union and Ilocos is far far North. The poor power supply to the province was a turn-off to investors especially industries, therefore, the local government decided to push for this project. Seeing the Bangui Windmills is definitely a wish come true for me and my wife. I mean, she has been here, but not in similar fashion. Sometimes, its not just about the place you visit you know, but the person you are with when you go there.haha. Again, the windmill farm is an amazing place to see. If you are a faily person, you might as well consider bringing your kids here and do a little education lecture to your children. It could be a very good motivation.A must see destination this summer!!!! contact a tour company---it's just cheap. We actually took a tricycle tour. the specifications on each places we visited in the summary that I will be making. 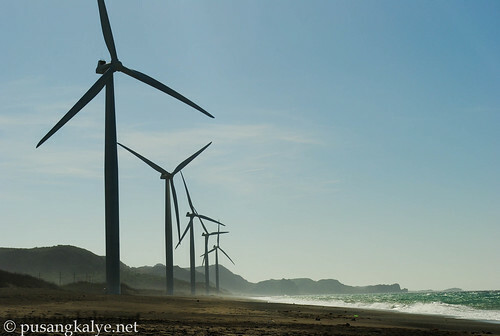 WIndy Ilocos Norte at its best!!!!! I don't think they were an eyesore. One day, I will see them myself. A dream come true for myself as well when we went there..
We're going here sa June! Wohooo! I can't believe you thought they were an eyesore! When I first saw them in photos, I immediately wanted to see it in person. I swear kelangan si Mang Arnel din ang maging trike tour guide namin. Hahaha. whaha inggit mode dapat alis kami ng tropa noong march to go on ilocoslandia kaso nashort kami heheheh... inggit talaga. 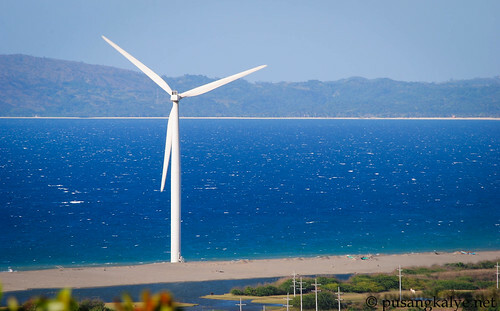 anyway mukhang todo enjoy ka naman diyan eh..ang balita ko eh 1/4 ng ilocos eh galing sa energy na windmills na yan! Sobrang ganda mo naman magpicture. Kakainis na! Haha. Nung kami nandiyan, di ganyan itsura ng pinicture ko. Digicam lang kase. Haha. We went there last year at kahit anung pagmamalaki ng ate ko na madami at normal sa kanila sa USA ang ganyan, di ako nagpaawat at nagpunta pa din kami. NapaWOW na lang din ako nung nakita ko. Nakakamiss tuloy pumunta diyan. Pero maganda talaga ang shots mo. Ugh! haha sumi sweetness si anton!! Sobrang ganda. The last time we went there, ang lakas ng hangin. Wow, Ilocos trip this time! Did you visit Vigan in the south? how much you paid for the tricycle tour? my boyfriend and i will visit Bangui this weekend.